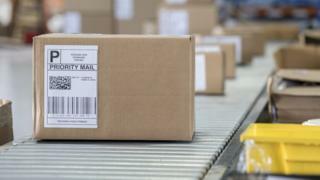 Home Latest News How green is your parcel? It’s Friday lunchtime and you’ve found the perfect dress for that party on Saturday night but you’re stuck at your desk. No problem, because after a couple of clicks, it’s in your basket and on its way to your home. This is the joy of online shopping, and our love of it continues to grow. 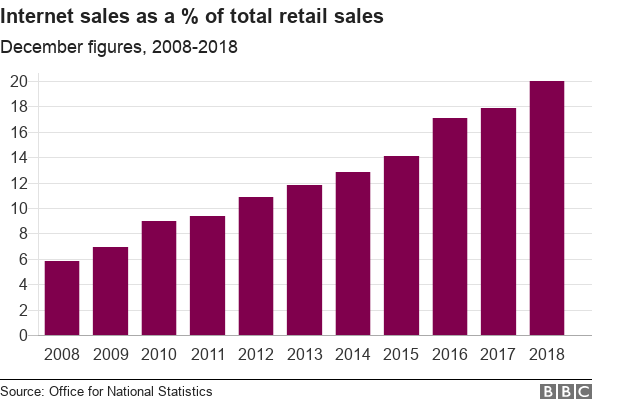 In 2017, online sales increased by 15.9% to £59.8bn in comparison with 2016, while in-store sales saw a jump of only 2.4%. But what price does getting something this fast cost the environment? Green campaigners argue our demand for getting something delivered at speed – whether it’s Amazon Prime or Premier Delivery on ASOS – is adding to carbon emissions. “Transport is responsible for a huge chunk of the UK’s carbon emissions and the levels are actually increasing,” Muna Suleiman from Friends of the Earth says. “Delivery companies are a significant part of this. How are delivery companies reducing emissions? Each year, the Royal Mail delivers around 1.8 billion parcels – by foot, bicycle and gas guzzling vehicles. The company says it’s committed to reducing its carbon emissions further. 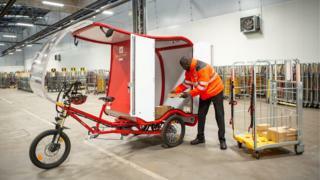 This week, Royal Mail is introducing eight e-trikes into its fleet. 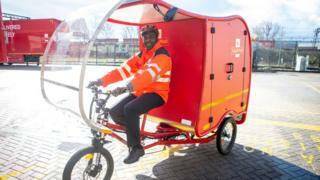 The vehicles are powered by a combination of pedal and battery power and will be delivered by posties in Cambridge, Sutton Coldfield and Stratford in London. It’s part of a six-month trial and if successful could see the scheme extended. “Our e-trikes are zero emission vehicles,” David Gold, Royal Mail’s director of public affairs and policy, explains. “The 48v lithium battery is charged overnight by mains power but is supplemented by solar panels on the roof of the vehicle. 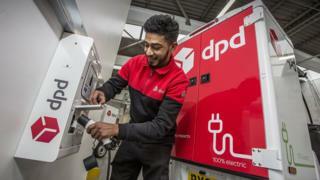 Royal Mail already has a fleet of 100 electric vehicles and has announced plans to expand it. “We have the largest ‘feet on the street’ network of 90,000 postmen and women, and we have reduced carbon emissions by 29% since 2005, but we want to find even more environmentally friendly ways to deliver to 30 million homes across the UK,” David Gold adds. 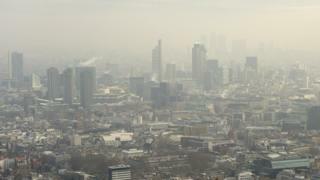 Next month, an Ultra Low Emission Zone will be introduced in central London to try and reduce air pollution. It means some of the most-polluting vehicles will be charged for entering the city centre. The government wants other towns and cities to follow the capital’s lead, and many delivery companies say they’re already prepared for it. Yodel is one of them. It says it’s making “significant investments” to reduce its carbon footprint. It delivers around 145 million parcels each year in the UK – in its peak period it says it delivers around one million a day. “We have invested in technology to calculate the most efficient routes and evaluate our drivers’ driving style to further reduce our carbon footprint,” Yodel’s CEO Andrew Peeler says. DPD says it’s changing the vehicles it uses in the future too. The company normally orders one thousand diesel Mercedes Sprinter vans every year, but says it’s now only going to purchase electric in future. It’s already got three all-electric micro-depots and is aiming to have eight in London. 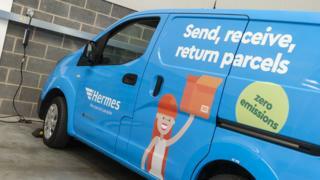 Hermes is also going down the electric vehicle route – at the moment it’s got 32 electric vans operating in London. Additionally, the company, which delivers 335 million parcels in the UK each year, claims to be the first in the market to use bio methane fuel to power 30 vehicles. It says it’s placed the largest opening order of thirty Compressed Natural Gas tractor units after a year-long trial. The vehicles now make up nearly 20% of the 166 tractor units in the fleet. Although delivery companies are starting to make changes, some critics say they need to do more. “We need to see delivery companies switch their entire fleet of vehicles to ones powered by clean energy,” Doug Parr, chief scientist for Greenpeace UK, says. It’s not just about how the vehicles are powered though. “It’s essential they’re constructed in a way that keeps their environmental footprint as small as possible, and so that their components can be re-used and recycled at the end of their lives,” Doug says. The campaign group also says it wants to see more bicycles and e-bikes used to reduce emissions and pollution. Hannah Morgan admits she was addicted to shopping online. She’d spend up to £9,000 a year buying clothes online – returning most of them. “I knew I was likely to return 80% – 100% of my order, and with free delivery and convenient time-slots to choose from, my online shopping addiction felt harmless. Hannah gave up buying clothes online at the start of 2019 after watching Stacey Dooley’s latest documentary on fast fashion. Hannah has tried to stop the temptation of buying by deleting shopping apps and unsubscribing to all marketing emails. 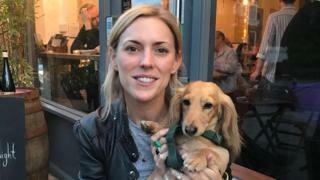 Campaigners say consumers don’t have to take drastic action like Hannah in order to cut emissions. “By choosing companies using greener delivery methods you can show that the consumer demand to cut emissions is there”, Muna Suleiman from Friends of the Earth, says. What about the big online retailers? Whilst Amazon doesn’t directly deliver its parcels, it has recently committed to make “all Amazon shipments net zero carbon, with 50% of all shipments net zero by 2030”. But Doug Parr from Greenpeace UK says companies like Amazon could impose “stricter standards” on the delivery firms they use. “Responsibility for this goes right up the chain of command – Amazon is generating the business so Amazon should be asking how its delivery agents are making those deliveries clean. Is click and collect the answer? Whilst our appetite for online shopping is in no way declining, click-and-collect services could be one way to cut emissions. Customers collect the goods at a local shop or designated pick-up point, like a newsagent or garage, when it’s convenient for them. It’s not just convenient for the consumer but with deliveries going to one place, emissions are instantly reduced. However, it could be entirely counter productive, if the customer takes their diesel or petrol car to pick that parcel up. Well once you built your buyers list with “Titans of Zoo”...it’s time to add on an additional revenue stream and learn the secrets of affiliate marketing from the industry’s top-earning super affiliates.